Reminder of the Angel Party at the premises of Angels by Lucie in Blackacre, Tuam on 11/11/2015. What a great high vibration day for an Angel Party. It promises to be busy, busy, busy. I can feel it already. Lots of fun, chats, connections with new people, dare I mention Christmas gift shopping and information exchanged. Lucie is taking bookings for Angel Readings and Indian Head Massage. Her website is www.angelsbylucie.com You can also contact me through any of my social media pages, buttons to the right of this page, to book or ask for information. 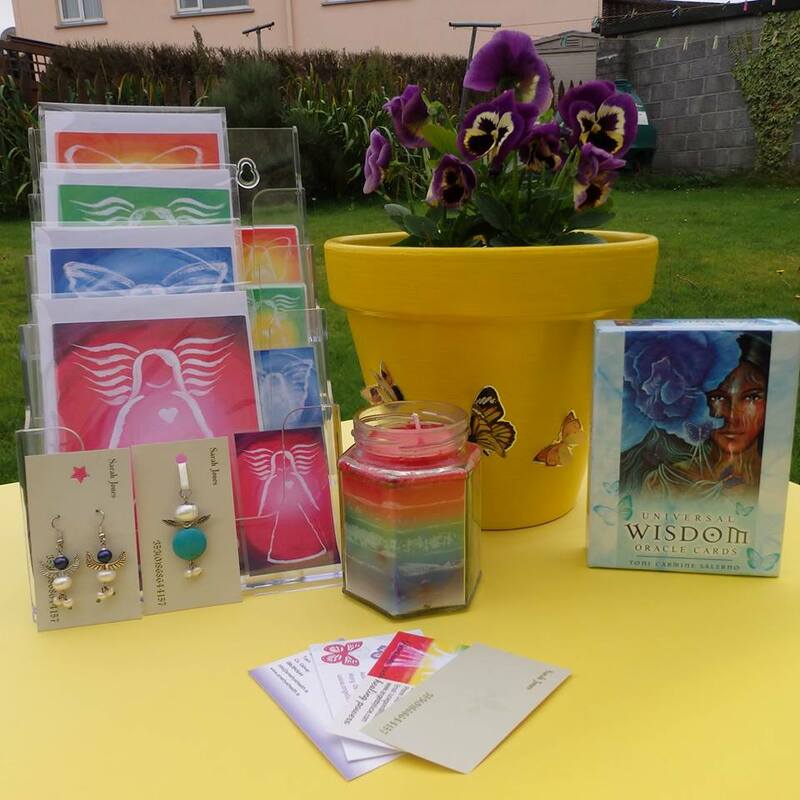 Aswell as the readings and massage, there will the lovely products that you see in the picture. Crystal jewellery by Sarah E Jones of Headford. My books aren't in the photo but will also be on sale there, plus my third book - More Quotations and Affirmations by Mary Keena Donnellan. The beautiful crystal healing candles by Amethyst Health and some beautifully decorated flower pots in chakra healing colours by Catherine Corkery. Lucie of course will have a selection of her paintings, her wallet sized affirmation cards, greeting cards and prints for sale too.